Up for auction is this original oil on canvas self portrait by ANDY WARHOL. Measures 26x26, unsigned, damage under subject's left ear has been repaired by relining, otherwise in good condition. Provenance: I acquired this painting in 1987. It came from Ron Levine (friend of Andy Warhol and a murder victim of the Billionaire Boys Club in Beverly Hills) who gave this painting to his lawyer as a retainer. 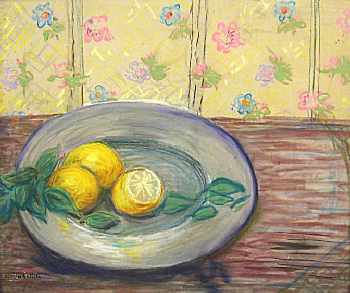 It then was displayed in a Beverly Hills art gallery who could not find a buyer. I was given the opportunity to purchase it. Following the shooting by a crazed fan, Warhol spent some time rehabilitating in medical care and was dismayed to discover a number of his works were stolen. He decided not to sign his works until payment was made for the piece. This could be how Levine acquired this piece. We will never know as Levine's body was never found. I tried to contact the Warhol Foundation to authenticate it but their reply was that more facts were needed to determine originality. 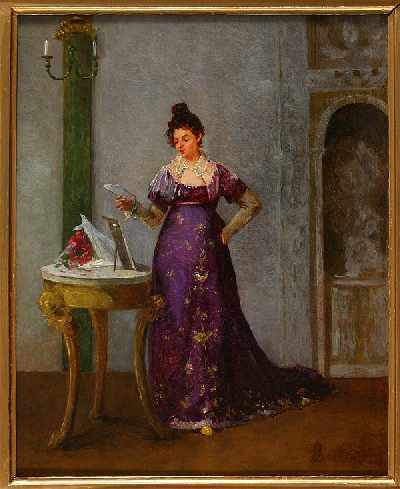 The painting was returned from the foundation with a "Denied" stamp on verso. 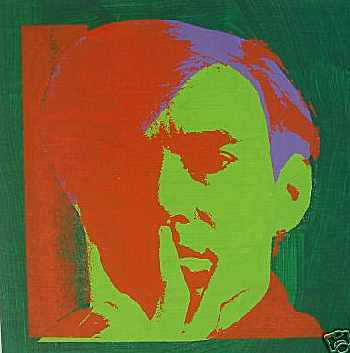 It is, nonetheless, a Warhol self portrait. Please email with questions. We agree with Warhol Foundation. This is NOT an original self-portrait painted by Warhol. The face doesn't look like Warhol's face. But it is painted in his style. Anyway, thank you to the seller informing about the letter from Warhol Foundation. Not all sellers do just that. 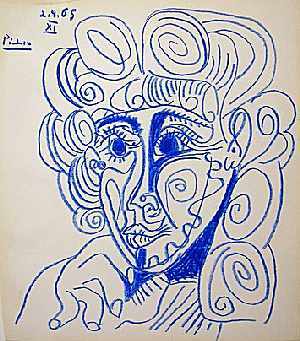 Pablo Picasso Drawing Signed Dated Numbered 1965 CrayonFull Provenance, Authentification, & Appraisal Provided. This auction is for a delightful and engaging crayon drawing by Pablo Picasso, signed, dated, and numbered. The piece has been affirmed and authenticated (provenance including appraisal, ownership history, and documents upon request). According to the papers of authentication this drawing dates from 1965. Impossible to read the document. But the drawing is NOT a genuine work by Pablo Picasso. We are professional art dealers over 30 years with a great experience and excellent feedback reputation. 100% authenticity guaranteed - bid with confidence! The painting was slightly overcleaned, but restored by a professional restorer. The signature is a bid frictioned but still to identify - see in the Benezit . This painting is too bad painted, has too many bad details, to be a genuine work by Alfred Stevens. PROVENANCE - Came out of a private house in Sussex where it had been in the family collection for at least 50 years (probably a lot longer). Historically the family had been weathly collectors for the least few generations. So far every other item, ie pictures, ceramics and furniture which have come out of this estate has been passed as genuine and of quality. 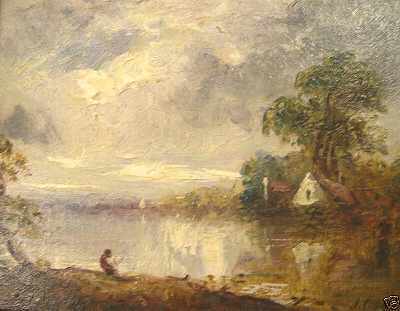 Sold without reserve is this high quality, 1824, oil on English oak panel painting of an angler fishing in a lake which is signed in initials and dated "J.C. (18)24" - see photo, which we believe is by the renouned English painter JOHN CONSTABLE (1776-1837). Sorry! This is NOT a genuine Constable.